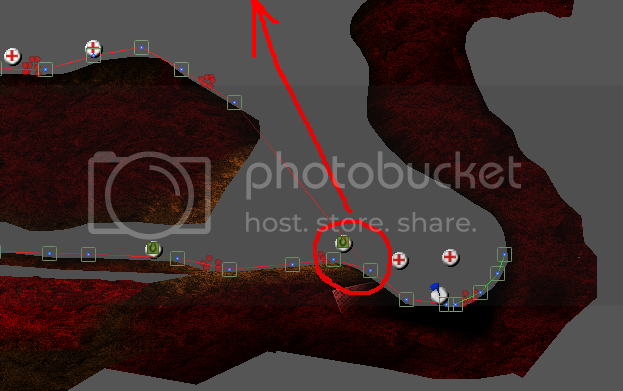 When the bot gets to the circled point, it will randomly jet into the air - not stopping until all fuel is lost. Even stranger is I have a single Jet+left waypoint that is loacated MUCH earlier. While Im here, Ill also ask - what path does the flag carrier take once it has the flag? Once someone gets the other team's flag, it follows the waypoints for the other team. There are always two sets of waypoints, one for bravo and the other for alpha. As for your waypointing problem, I suggest you look at maps with proper waypoints so you can see what you are doing wrong. I thought that was how it worked, and I figured it out. Somehow, the other teams waypoints were messing with alpha =/. You only need about half as many waypoints as you're currently using; you don't need to put waypoints at every bend of the polygonal landscape. Check the waypoints along that entire string (probably the one right in front of the highlighted one in your picture); it will have the "Jet" action checked. If it doesn't, then it must be because of the flag. If it's still doing it, let us know.